Arban’s cornet method is well-known in the brass pedagogy world. As was pointed out in a dissertation by Adam Dixon, “The Arban’s Method for Trombone originated from Arban’s Grande Méthode Complete de Cornet à Pistons et de Saxhorn, which was initially written for the cornet while Arban was Professor of Saxhorn at the Ecole Militaire [in France].” Dr. Dixon goes on to write, “Carl Fischer published the first popular edition of the Method for Trombone edited by Simone Mantia and Charles L. Randall in 1936.” Since that time, Carl Fischer has released newer editions of the Method including a recent one edited by Alan Raph. It should be noted that other publishers have competing versions of the Method on the market as well. This collection is an extract from the Method. 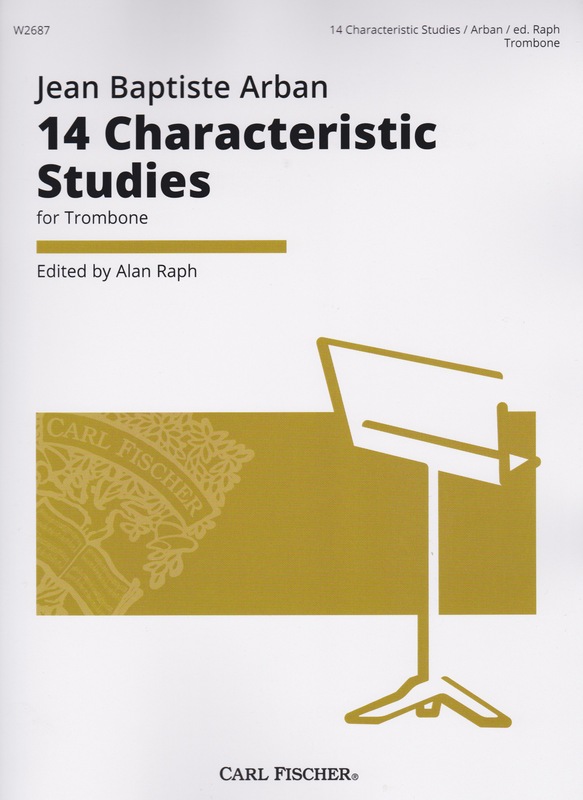 These 14 etudes represent a sort of finishing test for cornet students in that book. It should be noted that the term ‘Characteristic’ applies to cornet technique, not trombone technique. That leads me to my main concern here. Why? Why is Carl Fischer releasing a separate book with identical contents to another one of their books? Why are they highlighting material that is idiomatic to the cornet, not the trombone. There are many wonderful sections in the Arban’s Method but I would suggest that one simply purchase the complete Arban’s Method instead of purchasing this book separately. At any rate, these etudes are technically challenging. As might be expected of music composed for a valved instrument, there are frequent fast runs that will severely test slide technique. Some slide position suggestions are included although I cannot say if they come from Mr. Raph. They do at times appear to be intended for a trombone without F-attachment. For the most part, they seem to be good suggestions and take advantage of natural slurs in many cases. Two of the 14 etudes offer technical advice, presumably from Mr. Raph: “Numbers 13 and 14 will require a soft (or ‘legato’) triple double tongue to be played cleanly, i.e. Da da ga Da da ga (triple)/Da ga da ga (double) OR Da dle da da dle da (triple)/Da dle da dle (double).” I have no problems with these suggestions, I just wish more etudes included playing tips. Some of these etudes contain passages of flowing 16th notes that will likely exceed the breath capacity of all but the most phenomenal players. To state the obvious, the cornet is smaller than the trombone and this is further evidence that these etudes are characteristic for that instrument, not the trombone. With few exceptions, the range of these two-page etudes generally extends only up to g1 with a low end around G. Key signatures tend to favor flats over sharps and the harmonic language is clearly that of the 19th century. If you are seeking lots of runs in the middle range of your instrument, these etudes will serve you well but may prove frustrating because they were never intended for the slide trombone. At the very least the subtitle should read “for Trombone or Euphonium,” or maybe that’s yet another book. Your enjoyment of this book will be in direct proportion to your willingness to tackle challenges of this nature. I confess that I’m still scratching my head as to why this book exists. Do they intend to release another book of just the interval studies and another of the early articulation studies? I would prefer to see Carl Fischer release newer material that doesn’t just ‘evergreen’ what they already have in stock.